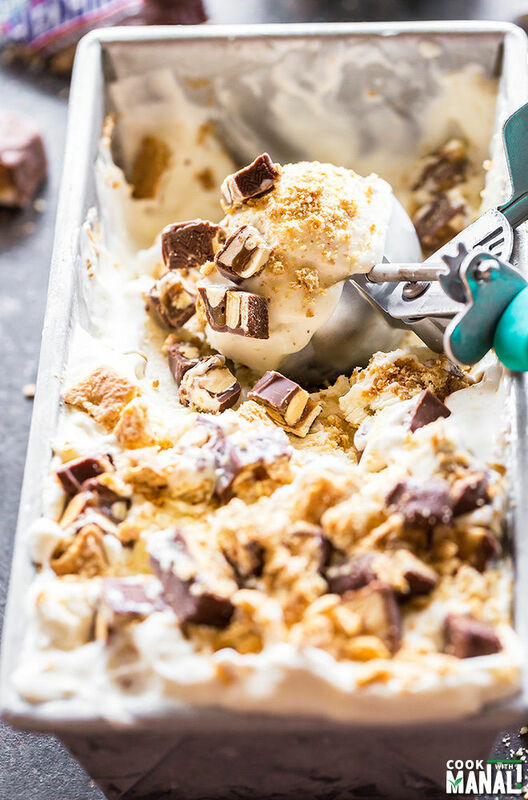 Snickers Cheesecake Ice Cream – No machine, no churn and only 5 ingredients! 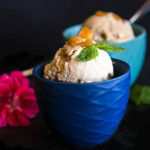 This might be the only ice cream recipe you need this summer! I have been in Houston this week and wow it’s hot here. Such a contrast to my lovely cold weather in Seattle. It’s such a funny thing but the heart always craves for what you don’t have, isn’t it? When it was cold in Seattle, I wanted some warmth and now when it’s really hot here in Houston, I want to go back to cool and crisp air of Seattle. Oh well! Ever since I have been here, I have been eating so much of frozen yogurt and ice creams. The warm weather makes you crave for all cold things. Can you believe I drank soda 2 days in a row! Oh my god, I can’t even remember the last time I had any form of soda [because I don’t like it one bit!] but well when it’s that hot outside and you have to walk all the time, it just makes sense. Anyway let’s talk about ice creams! Who doesn’t love them right? Until and unless you are my mom of course. I simply fail to understand how can anyone not like ice creams? 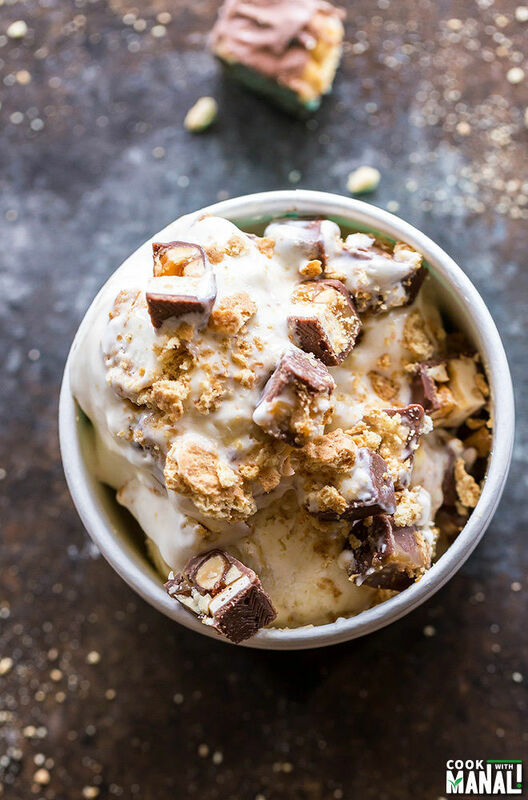 and seriously right now we are talking about this No Churn Snickers Cheesecake Ice Cream. I mean there’s Snickers + Cheesecake + Ice Cream! Can it get any better? Can anyone resist it? I had this idea of making snickers cheesecake ice cream in my mind for a while. I had a huge bag of snickers lying in my pantry and since it’s summers it was screaming to be used in an ice cream recipe. No churn ice cream are the latest trend these days and honestly I can see why. They are so easy and taste pretty amazing, especially when you consider the fact that it hardly takes 10 minutes to make them. 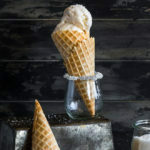 I am all for quick ice cream recipes and no churn are just perfect that way! To make this snickers cheesecake ice cream is super simple. You only need 5 ingredients to make this – heavy cream, condensed milk, cream cheese, graham crackers and of course some snickers. 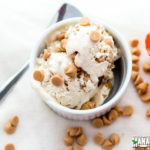 If you are planning to make a no churn ice cream this summer, then may I please recommend this snickers cheesecake ice cream. 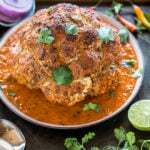 It’s one my favorite recipes and I am sure you will love it just as much! 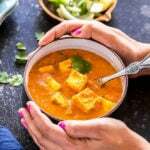 Place your mixing bowl and beater in the refrigerator for 20 minutes before you beat the cream. To a large bowl, add cold heavy cream. Using your hand mixer or wire whisk attachment of your stand mixer, beat cream till it forms peaks. Be careful not to over-beat. Set aside. In another bowl, beat cream cheese till smooth and creamy. Add in the condensed milk and mix till well combined. Start adding the whipped cream into the cream cheese mixture slowly. Fold in the whipped cream in parts and mix till all of it is combined with the cream cheese mixture. Your ice cream base is now ready. Now take the container in which you will be freezing the ice cream. Layer half of the ice cream base at the bottom of the pan. Sprinkle half of the chopped snickers and crushed graham crackers on top. Top with the remaining ice cream base layer. Finish with remaining snickers and graham crackers. Cover and freeze the ice cream overnight or until firm. 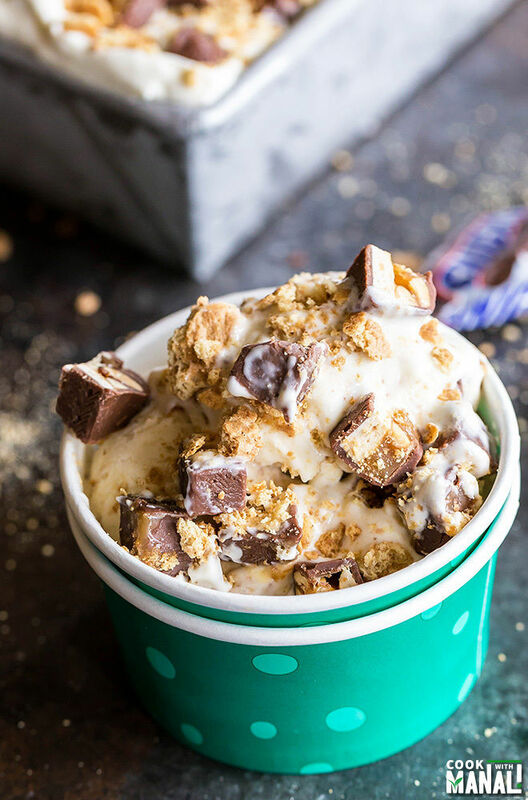 Scoop and enjoy this snickers cheesecake ice cream! * The ice cream should keep in the freezer for around 10 days, if it lasts that long in the first place! * You may use the entire 14 oz can of condensed milk, I just reserve 1/4 cup because there’s already extra sweetness from the snickers. * I used an assortment of snickers in this recipe. Different flavors tasted great! * You may add more cream cheese for a stronger cheesecake flavor, 5 oz was just perfect for me. No machine, no churn and only 5 ingredients! 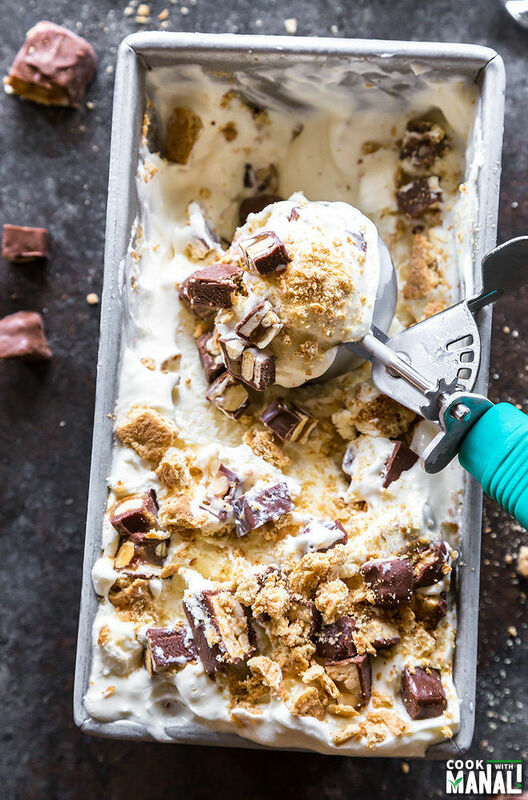 This Snickers Cheesecake Ice Cream is the only ice cream recipe you need this summer! Place your mixing bowl and beater in the refrigerator for 20 minutes before you beat the cream. To a large bowl, add cold heavy cream. 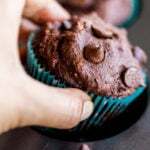 Using your hand mixer or wire whisk attachment of your stand mixer, beat cream till it forms peaks. Be careful not to over-beat. Set aside. Cover and freeze the ice cream overnight or until firm. Scoop and enjoy! Girl I LOVE snickers and I can so see myself finishing the entire container and not sharing at all!! This looks perfect for hot weather!! So how does it taste…looks good. When my mum was pregnant with me, all she craved was snickers and that obviously carried on in to me, because I LOVE them. This looks like a great way to eat them. Thank you Dannii! Snickers is awesome! Woah! You took one of my favorite candy bars and turned it into ice cream. I love this! 10 days? This ice cream would be lucky to last 10 hours in our house! Also, did I completely miss something? Did you guys move to Houston, or are you just there visiting?? haha it didn’t last 10 hours in my house either! Thanks David! No just here for some work, back to Seattle tomorrow! That’s a insanely rich and divine summer cooler! What a fun ice cream flavor! 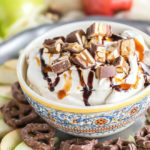 Snickers is one of my favorite candies, so I know I would devour this in no time! Thanks Gayle! I love snickers too! Snickers is my husbands all time favorite candy, so he is going to freak over this ice cream, Manali!! Love that it is no churn and the addition of cheesecake flavors is FABULOUS! Love it! Cheers, girl! 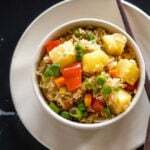 Manali, this looks absolutely delicious! My husband will surely love the combination Snickers + Cheesecake. Thanks Azu! It’s a pretty irresistible combination! I’ll take a double scoop! 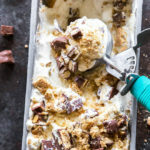 No churn ice cream is the best and I can’t resist snickers so I know I would love this. Thanks Ashley, no churn is definitely the best! Girl…I thought I was the only one who craved soda when the temps become unbearably hot. I have had more soda in Shanghai then I have had the entire year. Crazy, isn’t it? I think this ice cream would be a far better way to cool off. Plus I love that it is no churn (since I don’t have an ice cream maker). It’s so true, like I don’t like soda at all but in the last 1 week I have had more than I had in the last 2 years I guess! It just feels so good to drink soda when it’s hot! No churn ice creams are the best, glad you like this one!! You know that no churn ice cream is my jam! I’m loving this cheesecake one with snickers. It needs to be in front of me right now so I can dig in!! Oh my. Can I put a years supply of this on my Christmas list? Just gorgeous. So creamy, rich, and delicious! This would be a hit in our house, Manali. LOVE the look of this ice cream Manali! It looks so incredibly creamy and delicious. This looks sooooo good! I love how you’ve made it a cheesecake ice cream….and then Snickers too! This would disappear in no time in our house! omg this looks so tasty!!! i wish that i could have a bowl through the screen.. there is nothing better then snickers, ice cream , and cheesecake all in one! Hi Manali! I just couldn’t help checking your up on recipes. This looks super super delicious. But what can I substitute for graham crackers which is not easily available in Singapore ? I substitute digestive biscuits for graham crackers when I bake cheesecakes and can I with this ice cream? Thanks! Hi Susan! Yes of course, digestive biscuits would work well!